Amidst roaring crowds and a mix of rain and sun, the Finals match between Sarvodaya Vidyalaya Khanapur and Islamiya High School started at 3:00 PM today. The Hon. MLA Shri Satish Jarkiholi was the Chief Guest along with Shri Vinay Mangalekar, Shri Pandhari Parab and Rev. Fr. Basil Vagho as Guests of Honour. 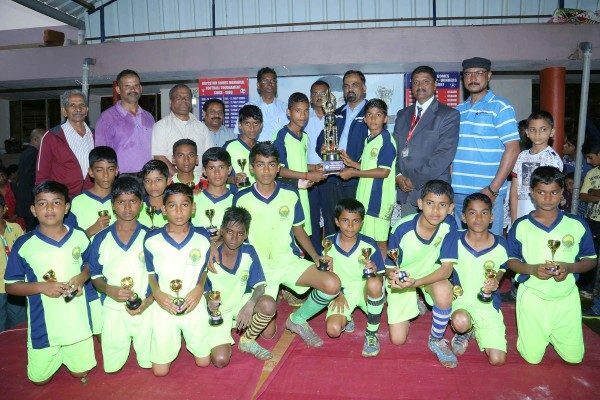 After the Chief Guest met the players, the match began. It was a super exciting match and both teams began well, attacking each other to score. But the privilege of bagging the first goal went to Islamiya when Muaviya Ahmed Ustad opened the score of the match in the 15th minute. Even though Sarvodaya tried their best to equalize, the score at half time was 1 – 0 with Islamiya in the lead. At half time, the young talented school kids of Sarvodaya Vidyalaya from Khanapur entertained the crowds with an excellent award-winning cultural item. The second half began with Sarvodaya on the offensive and putting pressure on Islamiya to score and they got their lucky break in the 42nd minute when ace-scorer and super talented kid Ajay Kadam scored a goal for Sarvodaya. Islamiya pressed on to establish their lead but the match when into extra time. Even extra time was not sufficient to determine a winner and the match went into penalty shoot-outs. In penalty shoot-outs Islamiya won the match 4 to 2. This is a 4th cup in recent years bro where are you? Congratulations for Super talented players of Islamiya School. Kudos to the Coachers, Administrators of Islamiya School and to the Event Holders and Sponsors.